The days are getting longer and warmer, and that means it’s time for golfers to get back out there and work on their short game. 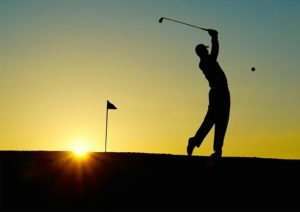 Luckily, The Sullivan has partnered with Tarry Brae Golf Course to offer a discount package that will allow golf enthusiasts to visit the Catskills and get out on the course for one low price. The package costs $201 for weeknights and $241 for weekends and includes overnight accommodations and continental breakfast at Ramada at The Sullivan Event Center, and 18 holes of golf, cart rental, and lunch at Tarry Brae. The course—designed by famed golf course architect, William Mitchell—ascends and descends the surrounding hilly terrain, doglegs bend around tree-lined fairways and well-placed bunkers, and many of the greens slope from back to front, requiring approach shots under the hole. The signature hole of the course is the sixth, a short, par-5 where the green is beautifully framed by Echo Lake. The hole is designed to be more captivating than difficult—several challenging par-three holes highlight the difficulty of the course. The Tarry Brae Golf Course is only 15 minutes from The Sullivan, and has recently been renovated with new irrigation system to keep the fairways green and the water waste to a minimum. Following the day on the course, guests can dine at one of The Sullivan’s three on-site eateries, Crust, Brew, or BHR. For the non-golfers of all ages, there are plenty of things to do in the area. From nature hikes to shopping excursions, the Catskills have something for everyone. To take advantage of this deal, please call (845) 796-3100, or visit our contact page.